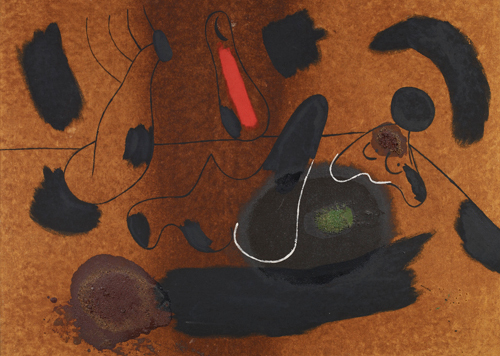 Inscribed on the back: Joan Miró. / "Peinture" / été 1936. J. Dupin, Miró, Flammarion, Paris 1961, no. 449, p. 326. 1964. London, The Tate Gallery ‒ Zurich, Kunsthaus, cat. no. 141, repr. pl. 27a. 1980. Washington D.C., Hirshhorn Museum and Sculpture Garden, Smithsonian Institution ‒ Buffalo, Albright-Knox Art Gallery, cat. no. 24, repr. p. 73 (col). 1982. Houston, The Museum of Fine Arts: "Miró in America," cat. no. 18, repr. (col). 1982. Edinburgh, Scottish National Gallery of Modern Art: "Miró's people," cat. no. 13, repr. p. 29. George Heard Hamilton, New Haven, Conn.